* Niles Beach, and Wingaersheek Beach. 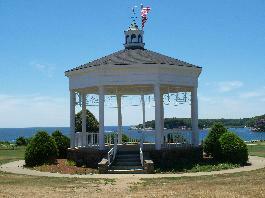 If you are reserving the Gazebo or Rose Garden the $250 will reserve the area for two hours. All other locations can be used as long as needed. The cost of the permit is $250 for all non-residents and reservations are taken on an annual basis.
) or mail a $250 check payable to "City of Gloucester" to Parks Department, atten: Diana Bishop, 9 Dale Avenue, Gloucester, MA 01930. If you are making your reservation through the mail you must also send the following information with the check: Names of both people being married, time of service, location, date, approximate number of people attending, mailing address and phone number. If you are getting married at one of Gloucester's beaches you cannot hold the service before 5:00PM between Memorial Day and Labor Day. Some basic rules apply at all locations - no alcohol, no vehicles on the beach, no arriving early to reserve space, chairs and canopies may be set up in the event of inclement weather.